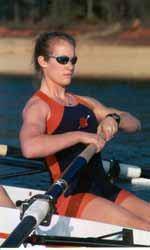 CLEMSON, SC – The President’s Commission on the Status of Women at Clemson University selected Clemson rower Megan McGuirt as the recipient of the 2002 Outstanding Woman Award in the Undergraduate Student category. McGuirt was honored last night at a reception, where President and Mrs. Barker presented the award. The outstanding woman award is given to a person who best exemplifies the very fine women on this campus, and the excellence that women bring to their jobs, their professions and their communities. McGuirt, a senior from Shreveport, LA, is a co-captain for the 2002 season. She was just recently named Clemson rowing’s first strength and conditioning All-American. During the 2000-01 season McGuirt rowed in the varsity 8+. She is a member of the 2001 Atlantic Coast Conference Crew of the Year, as well as being named to the ACC Academic Honor Roll. McGuirt is an active member of the Student-Athlete Advisory Board, the NCAA Women’s Sports Committee, the ACC Committee for Student-Athlete Welfare and the NCAA Committee for Women’s Athletics.